I don't know about you but I LOVE Christmas time! All the Christmas carols, happy faces, and those beautiful Christmas lights! But in all honesty, who really enjoys putting them up? You have to grab the ladder, make sure you have an extra person for safety....and the tangled up lights with blown bulbs. It's a mess. This year toss the tangle and try the MSY Christmas Projector. It's easy to set up and easy to put away...no tangle or mess and you get amazing lights that can be used any time of the year. The projector is controlled by a remote and has different settings so you are able to set to your preference. Choose one color or all three. 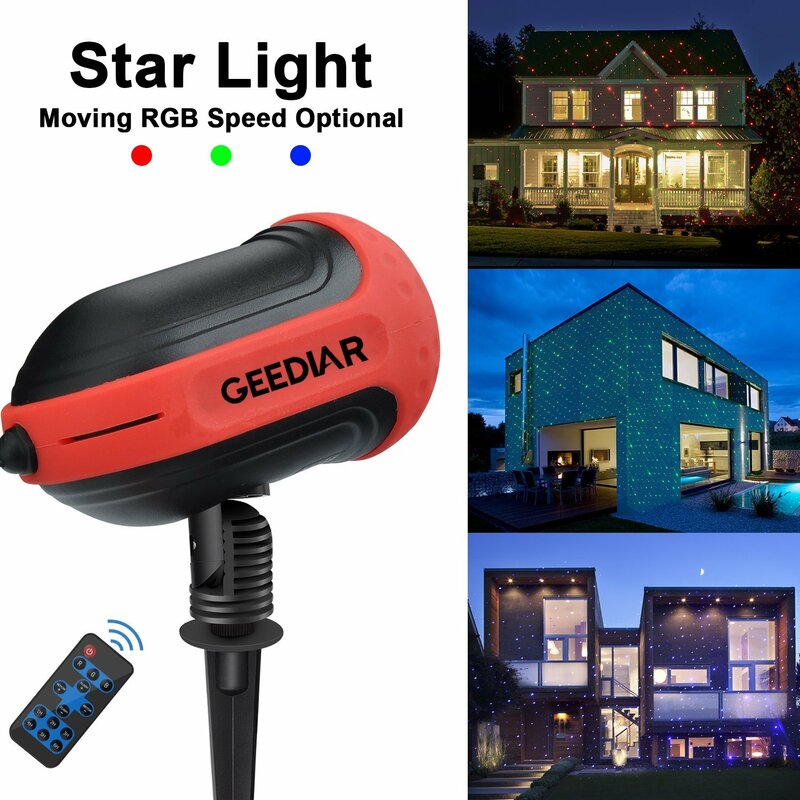 They move, they twinkle and have different speed settings so you can find the perfect setting to make your home sparkle during the holidays! 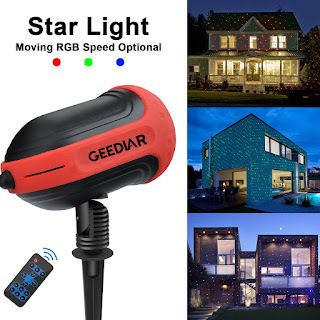 This Projector light can project thousands of light spots to decorate your parties, outdoor garden, lawn, house, water surface with thousands of light spots. It's easy to use remote control gives you the convenience to turn your home into a Christmas delight with just a touch of a button. It provides 3 different colors and a huge projection range of a 60 x 60 area. 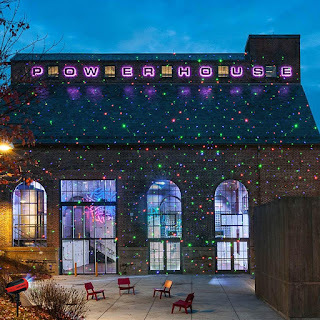 This light is very convenient to use, using 99% less energy than regular string lights. Just plug and play, no ladders needed! Installation could be finished in just a few minutes. Having a problem with storage? Spruce up your bathroom with a sleek pedestal storage cabinet. The Under sink storage cabinet fits snugly under your pedestal to give you extra storage space for the items that you need but have no place to put. Put extra toilet paper stocked out of site but easily accessible along with lotions and other items you need close by! This is a high quality under sink storage cabinet with a modern look. 2 layer design, with much storage space, helps to keep your bathroom organized and neat. Made from sturdy MDF, elegant white/blue painted. Modern European style, easy to match bathroom furniture. 2-layer design, dust-proof with double doors. Fit for certain pedestal and non-pedestal sink, facet holes: 18 * 20cm / (W*D). Easy to assemble, wipe-clean surface. Help to keep your bathroom organized and neat. If you have boys.....even the grown kind....Then you know how hard it is to shop for them during the Holidays. Let's toss the tie and undies idea and get them something that you know they will appreciate! 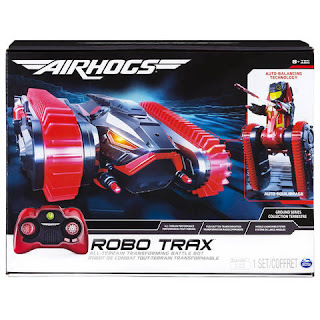 Stand up and take on anything with Air Hogs Robo Trax. This all-terrain battle tank can rip over any indoor or outdoor surface with its thick treads. Transform into robot mode and fire away using the two missile bays. Reaching an imposing height of 8” x 7” x 3”, Robo Trax is always ready to destroy! Even on shaky ground, this robot’s self-balancing technology is precise: ready, aim, fire! When things get treacherous, Air Hogs Robo Trax is designed for rough wear and tear. 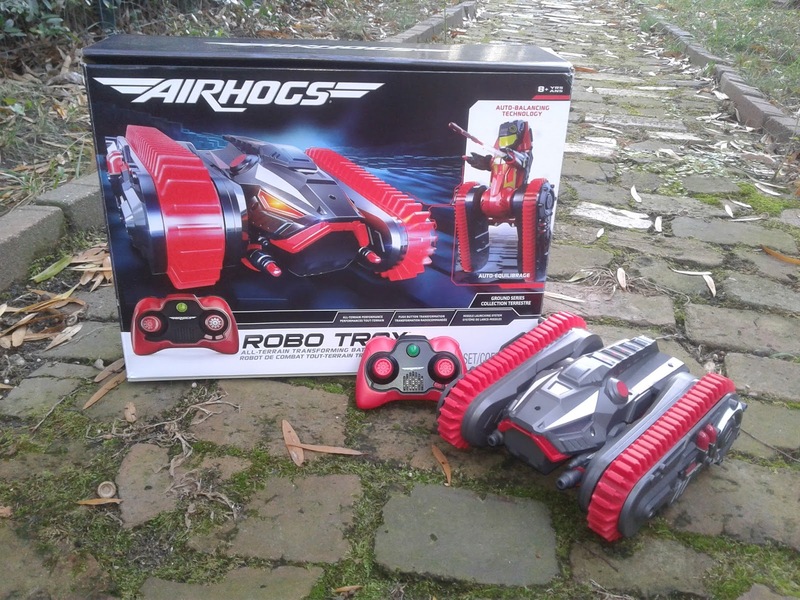 Stand up to any challenge, all terrains and all battles with Air Hogs Robo Trax! 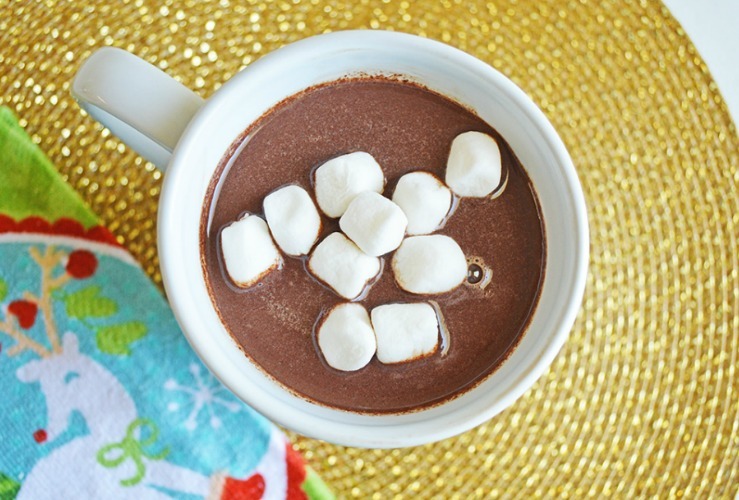 When the weather gets cold and snowy, you need 2 essentials: Crock Pot Hot Chocolate and Pfizer Pediatrics for when #SickJustGotReal. Momma Lew has information on both for you! Pfizer Pediatric is sponsoring a Sick Just Got Real giveaway. One winner will receive a $25 virtual visa gift card and (1) Children’s Advil® Suspension (various flavor), (1) Children’s Robitussin ® DM Day/Night Pack and (1) Children’s Dimetapp® Cold & Cough (U.S. residents only). Enter through the giveaway tools below. Good luck! Tis the season to be jolly...and also comfortable and well rested! 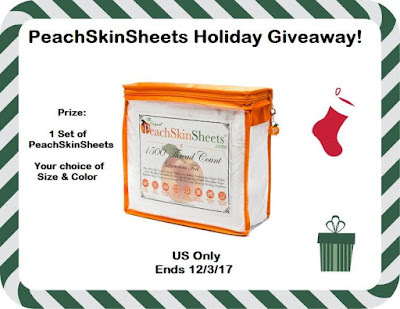 PeachSkinSheets are quality sheets that are reasonably priced and will bring you many nights of comfortable sleep. They will also make a great gift to place under the tree! 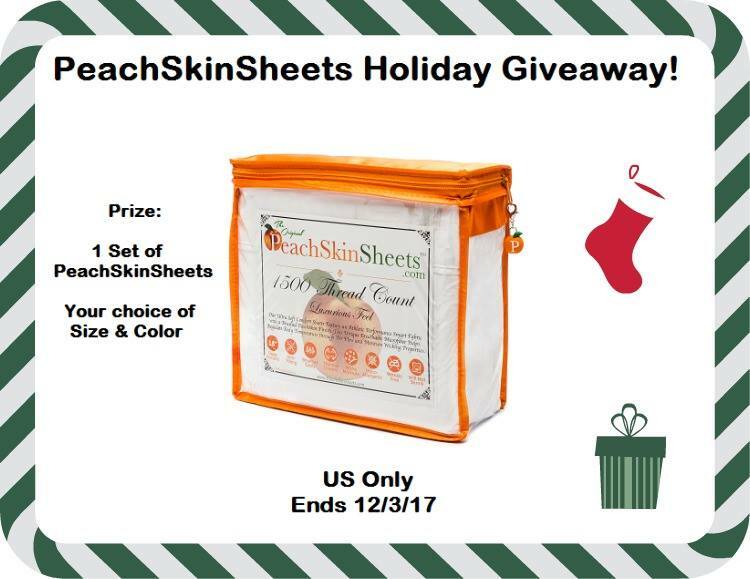 They have many amazing qualities and you can check these out by reading our Imperfect Women's PeachSkinSheets Review. Would you like the chance to try these awesome sheets out for yourself? You can enter the giveaway below or order a set for yourself by clicking here. a Rafflecopter giveaway Disclosure: We reserve the right to make revisions to cancel or suspend this contest for any reason. We are not associated with any of the companies named above. The odds of winning are based on the number of entries received. Open to the Continental US 18+ only. Confirmed Winner(s) (by Random.org) will be contacted by email. Winner(s) have 24 hours to respond before a new winner is chosen. No purchase necessary. Void where prohibited by law. The sponsor(s) will be responsible for product shipment to winner(s) of this giveaway. 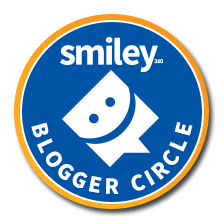 Imperfect Women and participating bloggers are not responsible for product shipment/delivery. This event is in no way administered, sponsored, or endorsed by, or associated with, Facebook and/or Twitter, Google, Pinterest. This disclosure is done in accordance with the Federal Trade Commission 10 CFR, Part 255 Guides Concerning the Use of Endorsements. Entrants must only enter with either one email address, IP address and/or Facebook account, anyone found violating these rules will be disqualified. It is at the sole discretion of the admin of the giveaway if the winner has met the rules or not. Hammacher Schlemmer has always offered a great selection of toys and home decor. This year is no different! Find everything you need this Holiday from the man in your life all the way to your pets. This year I was looking for something fun for my 12-year-old. He's at that age when he's too old for matchbox but too young for shaving kits :) I also wanted to find him something that would encourage him to go outside. Hammacher Schlemmer had the solution I was looking for! This is the laser tag set that allows two players to target each other from up to 100’ away. Each blaster sends pulses of harmless infrared light that are detected by the opposing player’s visor, which emits flashing LEDs to indicate nearby opponents and incoming fire from 360 degrees. Long-range mode allows players to engage each other up to the maximum range, requiring a manual “reload” between shots, while a push of a button converts the barrel’s bottom into a vertical forward grip and allows rapid fire mode (at reduced range) without the need to “reload”, ideal for quick fire from the hip during close-quarters assaults. Additional sets allow players to form teams. Set requires 10 AAA batteries. Ages 8 and up. Each blaster 14" long. This toy blaster makes and launches softball-sized snowballs up to 80', allowing rapid, long-range assaults during neighborhood snowball confrontations. Simply place snow in the forming chamber and close the lid; it packs three perfectly spherical snowballs. To blast your mark, place one snowball in the muzzle, aim the launcher, and pull back the slingshot mechanism—the distance a snowball travels depends on the force applied. Because the blaster is powered by elastomers instead of batteries, it provides uninterrupted, fast-action play. Ages 8 and up. We don't have snow just yet here in Virginia but we tried to improvise with some Party Snow....It didn't work all that great because it didn't want to stick together to make a ball. But the time will soon come when there is a foot of snow on the ground and we will have our epic snowball fight!! Hammacher Schlemmer also has other awesome toys for the entire family Here are just a few of their other selections. Hammacher Schlemmer even offers personalized gifts for that special someone. They also offer a great selection of toys and bedding for the fur babies in your life! Would you like an Air Purifier that is quiet and doesn't require any maintenance? Sure you would! In addition to how quiet it is, it is also aesthetically pleasing and fits into any decor. It has a built-in night light feature that you can turn on or leave off making it perfect for kids rooms as well. You should head on over to check out the review Tom's Take On Things did here. He gives it a 9.6 out of 10. Go find out why and how it made it into his 2017 Holiday Gift Guide as well. So here is your chance to win one! Open to residents of the U.S. Only, the giveaway ends on 12/1 at 11:59 pm EST. Tom's Take On Things nor bloggers helping promote this giveaway were compensated for this post. 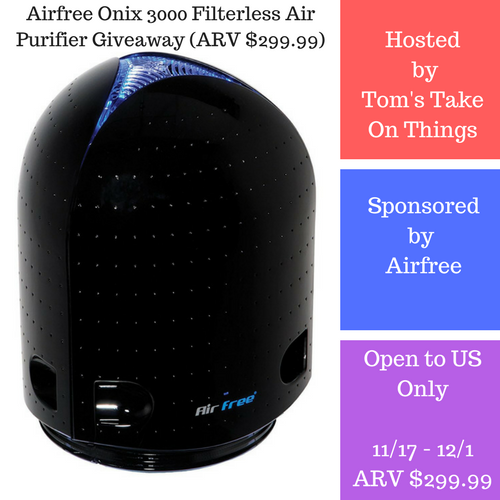 Airfree is responsible for prize delivery. With Kleenex brand, we can make the most uncomfortable symptoms seem a little easier no matter where we are! Kleenex also makes fun and adorable decorative boxes for the Holidays as well. You can have all the softness of Kleenex and decorate your home for the holiday! This snap strap and sealable lid make it perfect to strap onto a purse or backpack and pull out for accessibility on the go. Tired of small tissues falling apart or just not big enough to do the job? Try Kleenex Muli-Care tissues. The larger tissue helps to get the job done. The tissues are 75% larger and 50% stronger than Kleenex trusted care tissues. Although the Kleenex trusted care tissues are also great! These are great for stocking snacking, cleaning up spills or having around the kitchen. 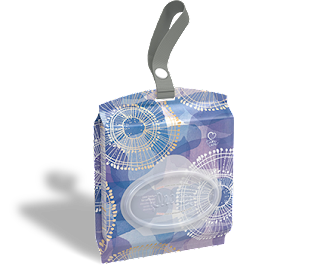 Kleenex Holiday Hand Towles work great for when you have all your family and friends over for the holidays! Instead of using up regular hand towels and spreading germs, have these wonderfully disposable decorated hand towels handy for all those guests! 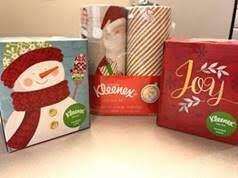 Kleenex offers great designs on the boxes, so don't forget to stock up on all their Holiday designs. 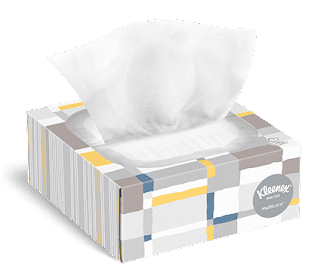 Decorate your home for the Holidays with Kleenex brand! When shopping for great beauty products that are affordable, it can be a daunting process. Especially when you want to find something that will actually work and work well with your skin. With Christmas also around the corner, we are rushing to find a great deal on gifts for our loved ones. Ionlyou Sonic Facial Cleansing brush is a great gift selection for that beauty savvy family or friend in your Christmas circle this year! 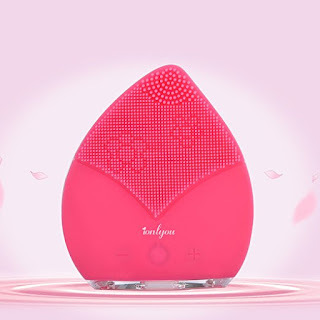 The Sonic Ion Facial Cleansing Brush has everything one can look for in a cleansing product. Deep cleansing care, anti-aging face washing, hygienic and anti-bacterial, soft and skin affinity material, and a satisfaction guarantee! Deep Cleansing Care: Removes 99.5% of dirt and oil, as well as makeup residue, dead skin cells and blackheads while reducing the visibility of pores. Meet a more luminous and youthful self. Anti-Aging Face Washing: It directs lower-frequency pulsations onto wrinkle-prone areas, diminishing the appearance of fine lines and wrinkles while leaving the skin looking firmer and more elastic. Hygienic and Anti-Bacterial: No replacement brush, no battery and no pain from harsh nylon bristles.This sonic exfoliator device is easy to use and easy to wash. Hygienic and anti-bacterial for your face. Soft and Skin Affinity Material: Made of FDA grade silicone, This Facial electric cleaner applies gentle pulsations to your facial skin using thousands of silicone micro fingers, massaging your facial muscles and exfoliating at the same time. Satisfaction Guaranteed: 1 YEAR MANUFACTURER’S WARRANTY - ACHIEVING YOUR BEST SKIN IS EASY when you upgrade your beauty arsenal with ionlyou! Not only is this a great cleansing brush but it makes a wonderful stocking stuffer or gift for the Beauty enthusiasts in your life! Learn more and purchase yours on Amazon! This post is intended for those of legal drinking age. Disclaimers are posted at the end of this post. As many of you know, I am a lover of wine! To me, there is nothing better than sitting down with a perfect glass of wine and relaxing at the end of the day. The only issue I have is opening a bottle to find that the wine I purchased isn't what I expected it to be. I feel like I've just wasted my money on something I will never drink. If only I could buy my wine by the glass so I'm able to try it before I buy it. HOLD UP....it's possible! Blason-Louis offers wine in just that way. So let me tell you a little bit about Blason-Louis. 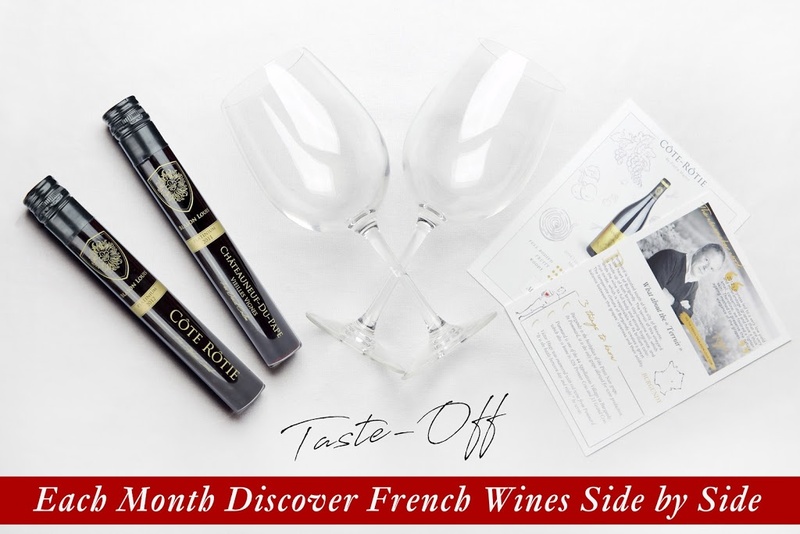 They simply have a shared passion :) Traveling to the most famous wine regions in France to uncover the most authentic expressions of it's terroir. This is not your every day bottling company who ships in bulk just to make a profit. This is a wonderfully complicated process where they look for perfection not only in their wine but the vineyard as well and carry this onto their customers for the best wine experience one could possibly have in the setting of thier own home. 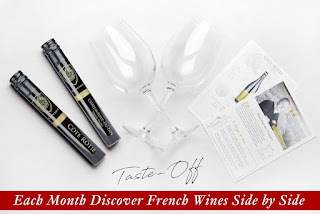 When you sign up to receive your wine, you are sent everything you need to know from the vineyard to the winemaker to explanation of that particular wine. An expert sent right to your home. I received two testers packaged pristine right to my front door. Both were a red wine. Now I will let you know that I am more of a white wine drinker but these red wines were amazing! This is a 2012 From Burgundy France and 100% Pinot Noir. It has a bursting Cherry, sensual Rose and inviting Cinnamon flavor. My first impression with the aroma was almost a woodsy smell with a hint of ginger and fruit. This is a fairly dry wine in my taste so if you are looking for something in that area, then the Pommard is definitely something you should try. This is a 2014 from Loire Valley France and 100% Pinot Noir. I didn't care for this one as much as I did the other only because I could taste a slight aroma of mushroom. I'm not a big fan but I will say that the aftertaste wasn't bad. I could then taste the grapes. It smelled divine and of cherries and woods. A very good wine. This is also a bit of a dry wine and would go great with a main dinner course. So they sent me some rules to this taste off! They are simple rules to make the experience all that much better. First rule: Flacon= 1 glass but if you are feeling generous, you can share. Third rule: before reading the taste-off board, test your own senses. What do you see, smell and taste? I had to fight for my right to taste....Neither one of them wanted to give me the glass back so I could try! 😧 But alas...I succeeded in my turn! And they were both delicious! Liability Waiver: In consideration for your being given access to the Site, you hereby release, waive, discharge and covenant not to sue the Company, subsidiaries, DBAs, affiliates, successors, contractors, agents, representatives and/or employees from any and all liability, claims, demands, actions and causes of action whatsoever arising out of or relating to any damage to your property or loss, damage or injury that you personally sustain, including death, whether caused by the negligence of the Company or its representatives or not while participating in Company programs, using Site content and/or attending Company Events in person, regardless of location. You hereby assume all risks to your property and your person and in no way will the Company be liable to you for damages or injuries you sustain.